I see the Ling as a ghost of a former time when people actually were interested in bringing history to their community… either feisty Vets or inspired civilians who campaigned long and hard to bring her to Hackensack. I also see it as a sad reminder of the commodization of history: unless there is a recent movie or shiny documentary about it or the area of concern, then the general public’s interest is fleeting, at best. As a result, the pool of potential candidates to continue generating interest in these boats is slowly shrinking… leading to even more challenges in finding the crazed folks who shun lucrative and easier opportunities for the sake of these boats and their stories. This rant wasn’t an attack or meant to be me being perched upon a soapbox, but the problem of interest and potential neglect is not limited to the Ling. As we drift farther from the events or individuals who made history, the tangible artifacts of those people and events will continue to be threatened by an unimpressed, unmoved, and uninspired mob with an exponentially decreasing attention span. Whether it is a sub, a collection of armor, a painting, a sculpture, or whatever – my greatest fear is that your honest question (again, not to attack) will be the rule and not the exception for anything from the past. My desktop background is a slideshow of American submarines in action during World War Two, and this picture happened to be the one displayed when I sat down to sort out various research projects. Since details fascinate me, I noted the proximity of the boat to the beach and – most importantly – the spray kicked up from the exhaust of the diesels while there were no indications of fore or aft movement of the sub. Since my collection of photographs typically bear no identification of the date or boat, I had to do an odd Google search to find the thousand words behind the photograph. 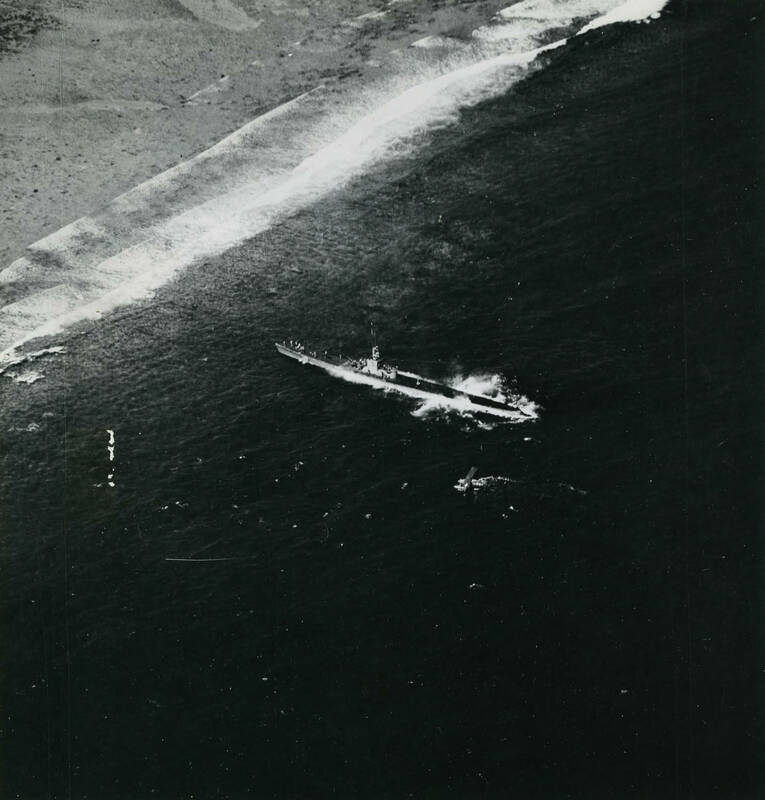 It turns out that this was one of several photos of the 1Apr44 rescue of Ensign John Galvin by the USS Harder (SS-257). Digging more into the patrol reports available online, I happily lost about an hour reading about how the boat was maneuvered 1500 yards from the beach, scraping the bottom of the hull on the reef and both screws being used to hold position long enough for volunteers to brave sniper fire and rescue the downed pilot. While there is much more to this story than the brief credit I give here, I will probably never get tired of examples of insane bravery of a generation which is slowly fading away to mere words on a page. The risks undertaken for the rescue of a fellow countryman never met… to delicately position a vital and far from maneuverable craft in shallow, unfamiliar waters… to defy self-preservation and succumb to convenient resignation for the fate one man… Yeah, these stories are extremely interesting glimpses as to how things can be done right. Would it have been better to save the Harder rather than the Ling? Well, no – the Harder was lost at sea in ’44… but what about the Archerfish (sank the carrier Shinanao in ’44) or Puffer (one of the 28 subs made in Manitowoc and later brutally pounded by depth charges in ’43 but survived)…? However, we are presently left with what we have… perhaps someone way back when looked at the rows of boats and failed to appreciate their individual stories. My point is that if one picture can inspire, then being in the presence of these boats could do even more, regardless of where the individual is from or how they can use that to build upon later. I think the horse has been beaten, and I hope that you get what I’m saying… that the problem isn’t just with submarine museums, or people, but the art of bringing them together in a viable manner – today and tomorrow. Previous If a World War II-era mine was dug up and accidentally triggered, would any victims be considered victims of World War II? Next In World War 2, how did American submarines perform so well despite their often problematic equipment?